There are a lot of things that could be said about Tari Tari, almost all of them good. A simple series, it knows itself well and is comfortable being just short of spectacular. For a viewer such as myself, who has had intimate experiences with music, Tari Tari speaks a little more deeply and touches just a few more emotions than it would for someone who’s never done music before. 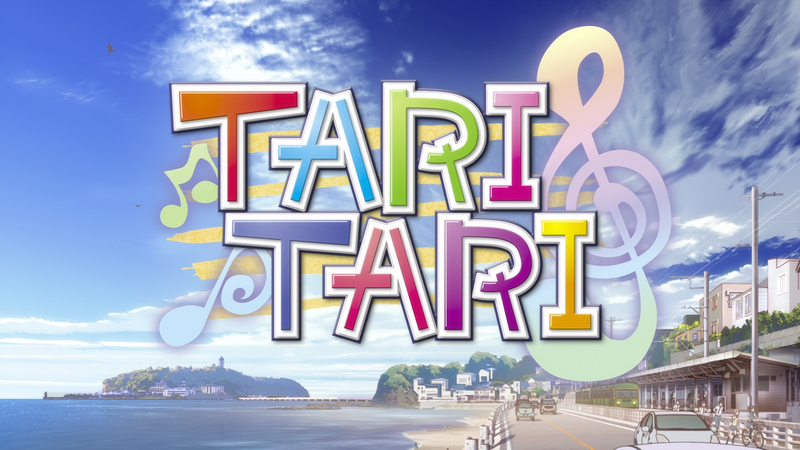 This isn’t to say that Tari Tari can’t be enjoyed by someone who isn’t hugely into music; it certainly can be. But as someone who spent his high school years happily singing in multiple choirs, the events that the characters of this anime go through ring very true to my own experience. For Tari Tari‘s ranking, check out my ongoing rankings. Tari Tari gets a very solid 7/10 from me. Read on for the full review! I have a lot of things to say about this anime, but I want to start off with its origins. An anime original production from P.A. Works, one of my favorites studios (there’s a blog post coming soon on that), Tari Tari features an ensemble cast of high school seniors. 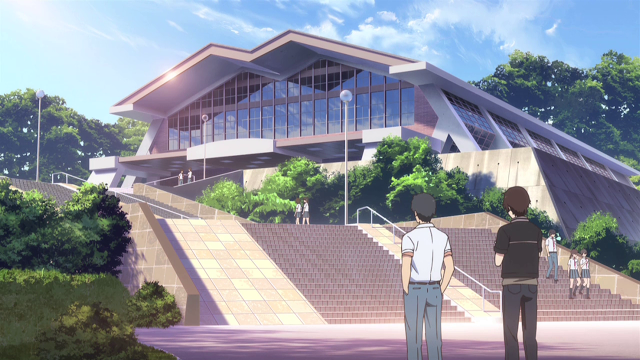 While the high school drama is not new territory, nor is impending graduation, Tari Tari manages to take the conventions and use them to their fullest potential. The portrayal of the quintet’s attitudes towards graduation, anticipation and more than a shade of anxiety and fond remembrance, rang as authentic and realistic. All five characters come off as genuine and realistic, but the standout by far is Wakana. While blonde-haired Konatsu is seemingly the main character of the show, Wakana is the emotional center. Her arc (episodes 4-6), which focuses on her coming to terms with her mother’s death, was the most emotionally potent and moving of the entire series. 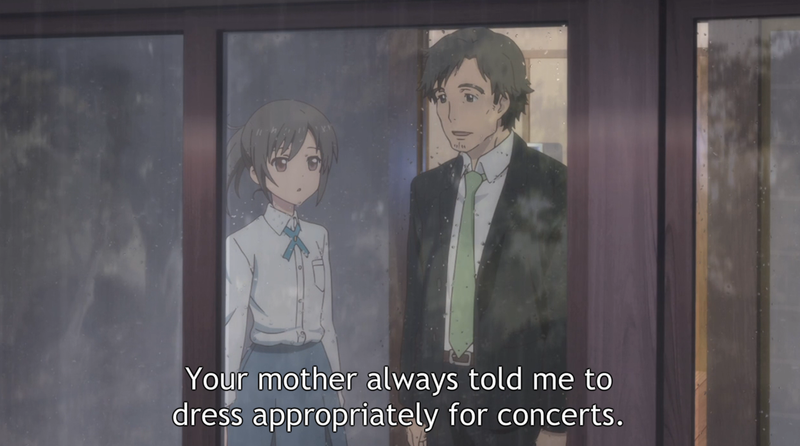 Tari Tari hit two hot buttons for me: firstly, music in high school, and, secondly, parent-child relationships. While there are a number of good parent-kid interactions throughout the show, the obvious love that Wakana’s mother and father showed for her was devastating in a wonderful way. The line that really hit me hardest comes from Wakana’s father, when he tells Wakana that “[Your mother] didn’t want you to be nice to her.” It was a simple line, but it rang of the truth of a parent’s love and instantly brought tears to my eyes. Seeing Wakana’s father struggle with watching his daughter’s pain was another beautiful moment and the payoff when Wakana finally comes to terms with her mother’s death left a small puddle of tears on my desk. Outside of Wakana’s arc, Tari Tari remains strong and likable, if light-hearted. There are too many quality moments to point out individually, but they can all be summed up in a single word: character. As a character driven drama, Tari Tari is incredibly reliant on its characters to drive the narrative, and they do so with relative success. Sawa, Konatsu, Tachi and the hilarious Wien all have their moments to shine, even if none of them can really match Wakana. The side characters, including the aforementioned parents, the principal, and the vice-principal, all add layers of depth to the show. Perhaps most critically for me, Tari Tari handles the importance of music with appropriate respect and in a manner that resonated with my own experience. There are a number of (sometimes cheesy) sayings about the role and nature of music, but the ones that avoided being too cheesy nailed it. Music is an incredibly unitive force, and its ability to bring people together is often underrated. Tari Tari shows that characteristic, and more. 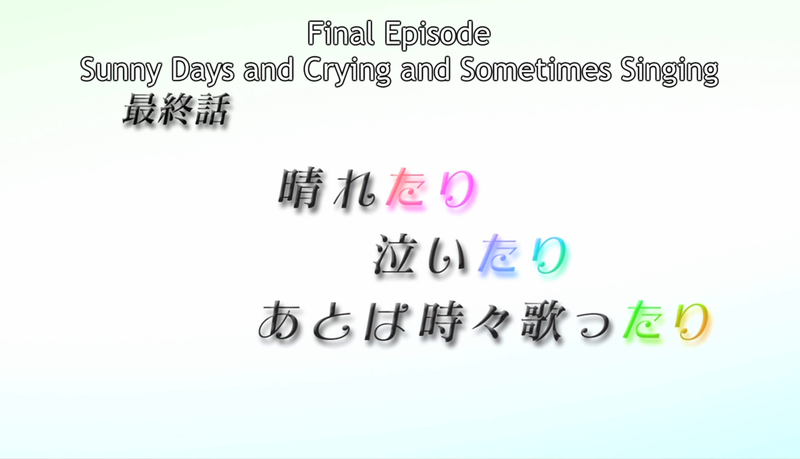 In the end, the title of the final episode, “Sunny Days and Crying and Sometimes Singing,” sums up Tari Tari pretty well. As a show, it’s rather unremarkable; not terribly inventive or adventurous. But good characters make even pedestrian works good, and Tari Tari ends up just short of being great. It is, rather, an excellent example of how the cliche, when executed well, becomes archetypal instead. Tari Tari fits neatly into a number of archetypes and is so honest that to call it cliche would an injustice to the anime. Before I wrap up, I must also say something about the animation. It would be a crime not to. It’s P.A. Works at their best; gorgeous. The character designs are attractive, but the background art is just that. Artwork. Tari Tari is a good watch. It falls just short of being remarkable, but it is a pleasant, heartfelt and heart-warming story with lovely characters and breathtaking animation. It avoids the pitfalls of the genre and executes itself well. It is a quality anime, with the potential to inject a little bit of sunshine with its cheery nature. If you do music, or have done music, you will appreciate Tari Tari‘s honest approach to the subject. Likable characters, and a sunny outlook on life. Wakana’s character arc is honest and true, and contains more than one beautiful example of good parenting. With so many anime parents absent, it is refreshing to see many of them populate the show and be good at it. Gorgeous P.A. Works animation and background art. Tari Tari has a definite ability to bring joy with it. That is a trait that makes anything worth watching. Fantastic character designs and development, beautiful backgrounds, and an interesting story. The characters feel realistic and very likable, and there are strong themes about family and friendship. If it didn’t had certain fanservicey scenes, it would be one of the best anime I’ve seen. Was there fanservice? I know there were a couple scenes with the girls in swimsuits, but I don’t remember them really being fanservicey moments. I would count these as typical fanservice scenes, of the most common variety, that are beach scenes, bathing scenes and hot spring scenes. Again, these were rather typical, and “tame” compared to the stuff in other series.